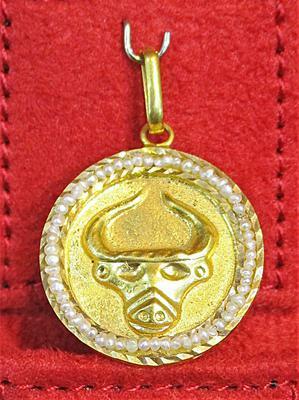 Weight: Total weight with pearls 7.09 gm. Unique Features: Dilmun civilization concept design. If you're a Middle East history buff you'll have heard of Gilgamesh and the ancient trading center called Dilmun. Archeological digs in the last half of the twentieth century in Bahrain by Geoffrey Bibby lead to conjecture that Dilmun was present day Bahrain. Looking for Dilmun by Bibby is an interesting read about those digs in Bahrain.